I am, like, the world's worst garlic mincer. It's a task I do not enjoy, maybe because I am lazy about it, or maybe because I grew up with a jar of the chopped kind in our fridge. My mince is more like a chop anyway - big and inconsistent. For work, I will sometimes toss a whole heads worth of peeled cloves in a small food processor. But at home I won't use it up fast enough. So the tip - right - and less of the type that is keeping you from the tip. Was the picture not obvious enough? 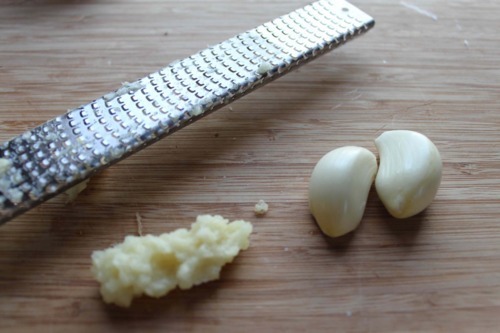 Use your micro-grater when a recipe calls for minced garlic. Takes approximately 1/8th of the time.